It may have been asked in one form or another, but I am curious how many C & V members have held onto a bike purchased new. A lot can happen over 30 years and there are a number of times I came close to selling mine. For me it has been 33 years this Summer. I hardly ride it anymore but there are so many memories and miles - and it was my first high end road bike - I doubt I could sell it. Picture is from late Fall 1978 three months after buying it. The Czechoslovakian bike shop owner obviously was partial to his country of origin as it had Barum tubular tires mounted on Favorit rims, the hubs where Campagnolo. Last edited by VintageRide; 06-04-13 at 03:32 PM. One from 1974, '75 and '81. Another from 1989. 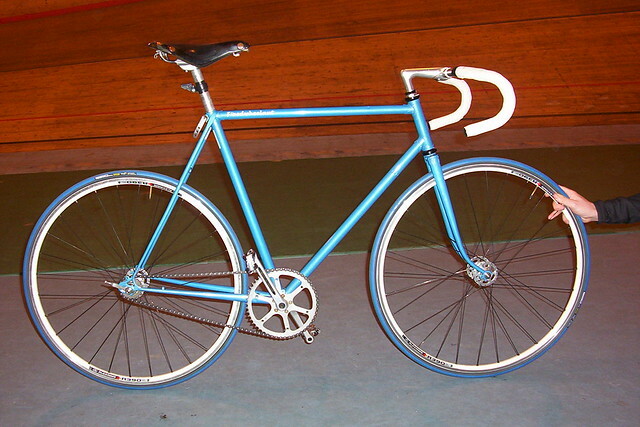 1978 TREK 700 series. Still ride it although I have changed the gearing as a concession to older knees. Still remember the day I bought it and have the sales receipt and brochure. I bought my Lotus Legend new in 1980 as a teenager, it was my first new bike. I remember I had saved all the money to buy it, but had to wait an extra week to pick it up because I forgot about the $24.00 sales tax. Lotus was so new at the time it wasn't even in stock yet at the LBS, I bought it from a photo. Sold the bike I bought new in 1975 two years ago. Rationale is that it never fit me (frame size at least 5cm too large), and it wasn't a great bike anyway. It was time to let it go. I have two bikes that I purchased used over 30 years ago...none of the bikes that I purchased new are still around, they were either sold or stolen. FWIW the two I still have are a 1974 Motobecane Nomade that has been upgraded and updated over the years, it was purchased as a basket case so I could put together a cheap tour bike to replace a Bob Jackson that had been stolen, and I didn't have the money to replace. The other is a 1972 Raleigh Sports Standard that I bought around 1982 to use for transportation, it is still hanging around being used as a beer run bike. ISO: A late 1980's Giant Iguana MTB frameset (or complete bike) 23" Red with yellow graphics. "Cycling should be a way of life, not a hobby. Close, but not quite. I bought my 1984 Trek 610 new, but it's now only 27 years old. 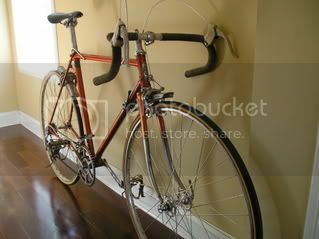 Also close: I bought my 1980 Masi GC used in 1986. It's over 30, but we didn't get hitched until she was 6. Bikes: Pinarello, Davidson, Raleigh, Univega, Marinoni, Lotus, Nishiki and Schwinn. Probably others too. It's over 30, but we didn't get hitched until she was 6. I got my oldest, C'Dale SR400 25 years ago, at age 19...crashed it this year but it's still ticking. Not much original except the frame! Bikes: Ron Cooper fixed audax, Holdsworth Monsoon fixed, Falcon hack fixed, Graham Weigh 531 24 speed, plus others in bits. I still have my Fathers bike that he bought in the late sixties, always thought it was a Lambert but it turns out it is a mid fifties Holdsworth Typhoon. My McLean is a 1982 model. I bought the frame and bottom bracket from the original owner in 1983, so almost. I bought a new bike in about 2008. That was a cheapo Nashbar fixie. Before that, the most recent new bike I bought was a 1979 PXN-10LE which was stolen a few months later. No more new bikes for me. Oh, and the fixie was stolen this past fall. I'm going to bump this thread in a couple years. Until then, I'll settle for "nope." You folks who have bikes fitting this description...too cool. We took a ride early this year with a bunch of C&V'ers. One guy came with his 1971 Raleigh International that he had bought new. It was gorgeous. There were others, too, if I recall correctly. I bought this one '72. I was 23. Still ride it. Have swapped out crank, wheels, derailleurs, handlebar, chain, freewheel. The pedals, stem, saddle, and brakes are original. Last edited by jimmuller; 04-11-12 at 08:32 PM. I still have a 1977/78 Bridgestone Kabuki Diamond Touring (sport touring bike) that I bought new in 1979. Cost a big chunk of change for a kid back then. Honestly, this has been one of the most entertaining threads I've read yet. I just traded away an old friend that fits this description a couple of days ago. In exchange, I acquired the twin sister of one of my very first "serious" road bikes. It was a bittersweet moment watching the old girl get wheeled away.